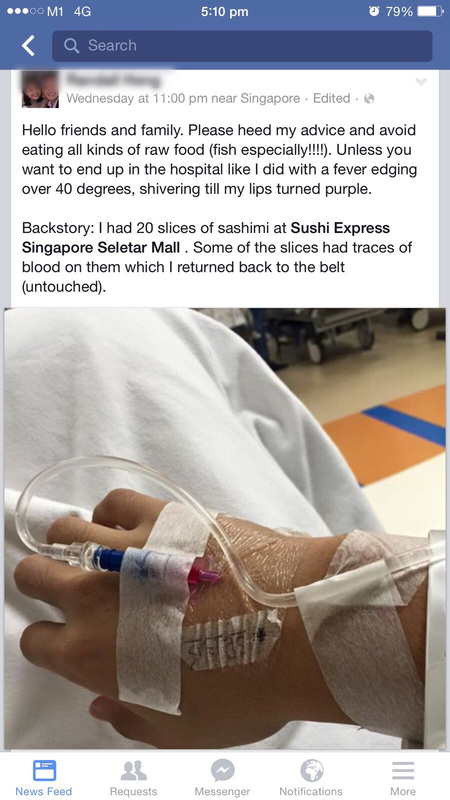 SINGAPORE – A local Singaporean went to Sushi Express located at Lida Square (Seletar Mall) to had his meal. He had over 20 pieces of Sashimi Sushi in the food chain. Shortly after, he found bloodstains on some of the plate of sashimi. Immediately, he then return them back on the conveyor belt untouched. Despite that, he had eaten over 20 pieces of raw fish. Soon after, he started to have fever as his body temperature rise over 40 degrees. Eventually he was hospitalized. He even mentioned that he shivered until his lip turns purple. The doctor then confirmed that he is hospitalized due to food poisoning. He is lucky to escape the streptococcal infection which can lead to death if not properly treated. He also advise everyone to avoid eating cold food, particularly raw fishes to prevent such problem. Updated on 6/1/2016 11:05pm: NEA has also started their investigations with respect to this incident and did not find any hygiene lapses in their restaurant’s food handling. NEA has also collected the salmon’s specimen for testing. I am sad on the fact that you are not dead. 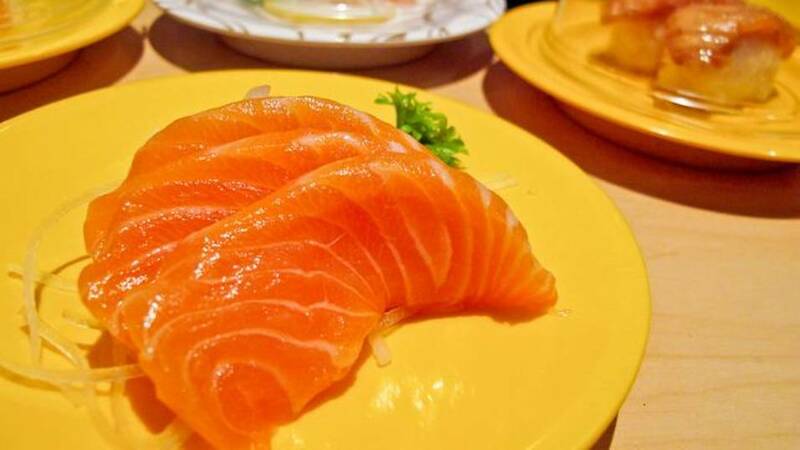 Hey Admin, did you plagiarise the salmon sushi picture from someone else’s album? It is so easily to always put the blame on the raw fish or the restaurant BUT eating 20 pcs or more raw fish meat or even if it’s half cooked beef etc. Isn’t that too much of a “good thing” at one go? Not being insensitive here but as consumers we do need to be careful and responsible as to how we eat and the amount of “whacking” too much at one go of just any one type of dish isn’t it? Blood stain but put back. Nice. Well it’s unfortunate, raw food do carry such risk. The written English… I am speechless! I think it’s only seletar mall sushi express have this problem. Tampines sushi express is rather okay… The manager is really rude (money minded) trying to rush and probably hit quota. The plastic container is really dirty, just becareful. Don’t fine at sushi express anymore to be safe!!! [Update] Channel 8 has already followed up on this in the statement below. NEA and MOH has issued a statement on 5 January saying that there are no hygiene lapses in the restaurant. According to MOH, the boy has been certified that he did not contract Group B Streptococcus (GBS) bacteria. He is currently discharged and in good health. NEA has also started their investigations with respect to this incident and did not find any hygiene lapses in thei restaurant’s food handling. NEA has also collected the salmon’s specimen for testing. Everyone’s body is unique and has a different tolerance level to various foods and consumption intake. If there is no hygiene lapse and certified by NEA, I will still continue to dine in their restaurants. why would he place the plate with blood stains back onto the conveyor belt? he shld have informed the shop staff.. why would you leave it for the others? Why return the plate to the belt? Why not take a pic and inform the staff? Was at sushi express at seletar mall awhile ago. Saw the staff pick up plastic cover from the floor and just put back onto the plate with food on the conveyor belt. Moreover the store was closing so the staff rushing ma so while the belt still running she spray some cleaning agent while cleaning stuff before the store closes, i assure that some of the mist landed on da food. Couple beside me also saw, then they immediately stop eating and pay up followed by me.